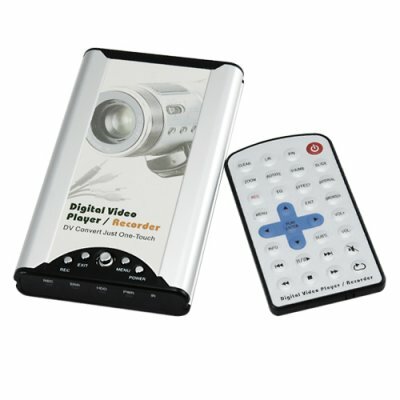 Successfully Added HDD Portable Media Player - One Touch Video Record to your Shopping Cart. 2.5 Inch SATA hard disk enclosure and multimedia player with a one touch digital video recorder for recording video directly from TVs, Camcorders, or other such devices in MPG4 format. This is a perfect DVR and Media Player combo for both recording your favorite shows or getting you digital media off the computer into a portable Hard Disk and playing on the TV. Great for movies, picture, or for music, and with many other great features built in, this HDD media center is an indispensable addition to anyone looking to make digital entertainment a real and affordable possibility. A hard disk drive (HDD) is NOT included with this model. This model accepts 2.5 inch SATA hard drives up to 500GB's. on 2008-12-27 23:28:31 Nice packaging, cool gadget. If it support more file format (.wmv,.3gp,.rmvb) or can upgrade firmware to another language ,would be excellent.